The month of May is Borderline Personality Disorder Awareness (BPD) Month and so to help reduce stigma I will be sharing posts about my experience and informative posts explaining the different aspects of BPD. I will also be sharing things on my Facebook Page so head over and check it out! Dialectical Behaviour Therapy (DBT)..sounds pretty full on doesn’t it? In reality it’s a great therapy developed by Marsha Linehan in the 1980’s to help treat BPD. Linehan first developed DBT to help women who struggled with suicidal ideation and self harm tendencies, after time she realised that these women also shared characteristics with those diagnosed with BPD. This therapy is founded on the theory that due to environmental or biological factors, some people react with a heightened emotive state, and continue in this state for an extended period of time. DBT helps to create positive coping strategies in order to help people return to their baseline emotive state more quickly. 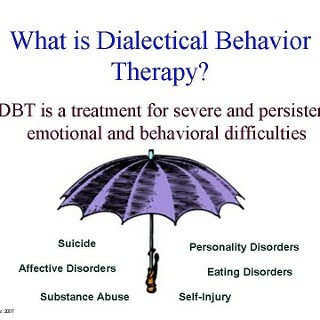 DBT is usually carried out in a group setting, with each participant also receiving one on one sessions with a psychologist trained in DBT skills. The therapy is broken down into 4 components consisting of Core Mindfulness, Interpersonal Effectiveness Skills, Emotion Regulation Skills and Distress Tolerance Skills. During the one on one sessions the psychologist may concentrate on the specific set of skills that the patient needs the most help with. Core Mindfulness Skills are the basis for which DBT is built on. They focus on creating a state of Wise Mind, in which a patient finds the balance between emotional response and logical response. The psychologist will tend to teach the patient that their emotions are valid, but that they need to find ways in which to express them in a positive manner. Interpersonal Effectiveness Skills focus on the relationships in the person suffering with BPD life. For the purpose of therapy, all interactions with other people are considered relationships. It is hoped that through developing effective interpersonal skills, the patient will be able to have their needs met, while still maintaining a positive relationship with the other person. These skills help to put into practice the wise mind techniques learned through mindfulness. Distress Tolerance Skills focus on the idea that everyone in life will encounter stressful situations and that we must learn not to hold onto these emotions. These skills teach the patient different ways to live with the distress, and to live in the moment. While the core belief of Distress Tolerance is to accept the reality we are in at the moment, it does not mean that you have to approve of it. This train of thought is carried out through distractions, self soothing, improving the moment and considering the pros and cons. People who suffer from BPD generally struggle to regulate their emotions, often having outbursts of anger and suffer from depression and anxiety. Through Emotional Regulation Skills the patient is taught how to label their emotions, reducing their vulnerability to emotional mind, participating in more positive activities and taking the opposite action to what they feel. The last point is mostly geared towards depression and anxiety, in helping the patient to start doing things that emotionally worry them. Skills learned during Distress Tolerance are also used to regulate emotions. Linehan had the desire to create a therapy that would help people to live a better life emotionally. It is intended as a long term treatment, that deals with a person’s beginnings rather than crisis management. Through this treatment it is hoped that people who suffer from the symptoms of BPD can develops skills to help validate their emotions, meaning that the time to return to a baseline emotional state is reduced. Isn’t that what we all want, deep down, to feel more stable? If you or someone you know is struggling, please don’t hesitate to get help. The first port of call is usually your GP, who can refer you on to someone you can talk to. If you are in immediate danger of self harming behaviour then please take yourself to your closest emergency department. This entry was posted in Mental Illness Information and tagged FYBF, mental illness on May 2, 2014 by Tegan. From a totally non qualified point of view, this is interesting to me because it seems like the brain has unlearned control methods of the kind that one would teach to a child as they grow up (or similar). Only as adults, we have more sense of the world, walls and all that stuff so it’s harder to retrain the brain. You’ve hit the nail on the head. People with BPD generally haven’t had their emotional experiences validated or the people in their life don’t express emotions in a positive way and so as a child they don’t learn the coping mechanisms in order to deal with those emotions. Self harm is also generally because of an emotional that the person feels is unbearable, which they haven’t been taught to deal with in a positive manner. Really informative post, Tegan. When I was seeing my psychologist, we went through mindfulness exercises (as well as many other things). I may not be diagnosed with BPD, but in my own levels of depression and anxiety, regulating my emotions can be a real challenge.